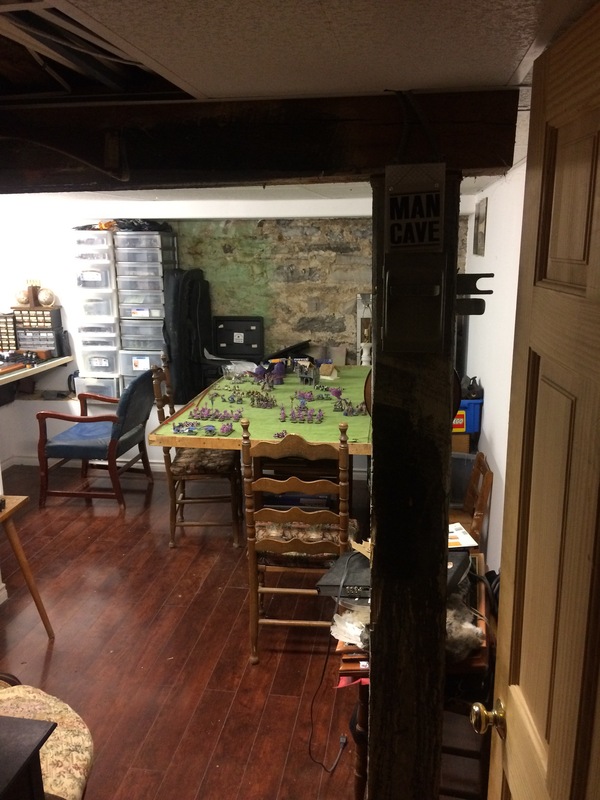 Well, after a long spell away, which included 2 versions of 40k and the new AoS, I have finally got my s**t together and have a mostly completed hobby room. I bought my first paints yesterday (space wolves?!) and started were I left off. Felt fantastic to paint again and I looked at my overly big 6x4 table for the room and my mouse eaten battle mat with only a couple of delapitaded trees and wood shacks ( I must have tossed my terrain at some point - might have been the flood) and decided to try out AoS. Three a unit of halbediers with a warrior priest, a unit of spearmen with a priest, an engineer with a hochland, and and elf contingent of archers, silver helms, 2 lion chariots , a Mage on a dragon, an arch Mage against a tzeench army of 60 horrors, a herald, two 6 man units of flamers and a unit of screamers plus a lord of change. Horrors were 2 x 20 plus 2 x 10 summoned units. Not sure what I was thinking regarding balance but I didn't care. An outpost to hold off the horde? Anyway, made it thru 3 turns before I had to sleep. Freakin loved it!!! The helms were terrific so far against the horrors. Flamers and screamers are pretty tough and dish out a lot of pain but my rolling is still crap. Priests are still standing but the halbediers had enough and the last for ran. Lion chariots are fun and the archers are still standing though decimated. Really enjoying this new game and it's so easy to play. Haha, that's fantastic to hear! I need to get a hobby room for myself one day. Definitely would make things a tad easier. Great to know you got back into the hobby with both feet on the ground and kicking chaos' mutated behind. 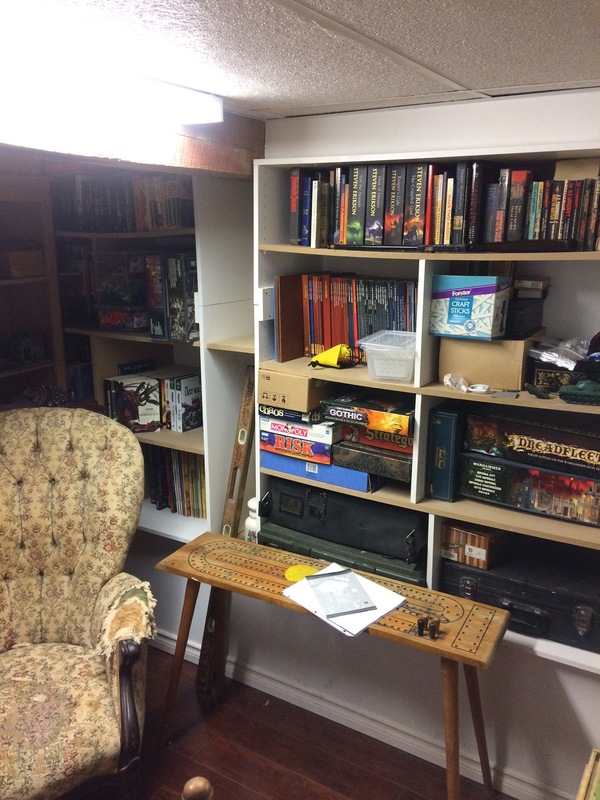 Any chance to see your completed hobby room Artoban? These are great news! 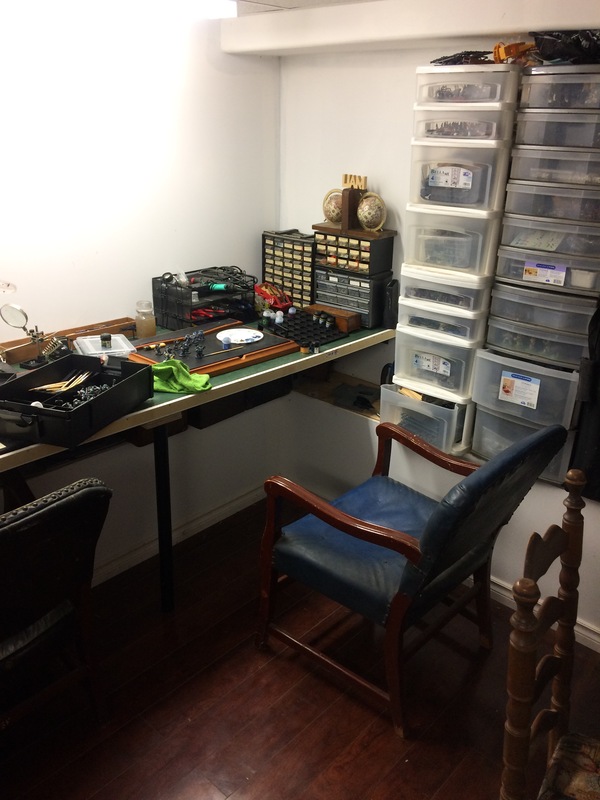 Ha nice that your back into the hobby mate and even happier that you are enjoying it again! Not sure what Warscroll to use for this deamon. 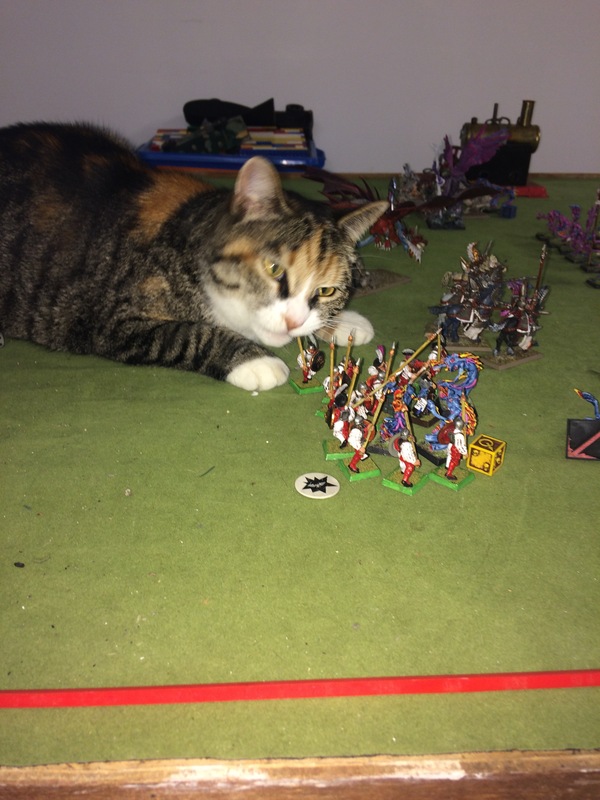 I hope that deamon cat is not chewing on that spear! Sadly yes. That's exactly what she is doing  That's from the very first regiment I painted some 13 yrs ago. I was such a newb at the game, I named it the Aslan regiment as liam was crazy about narnia at the time. Did the man cave pics turn out? 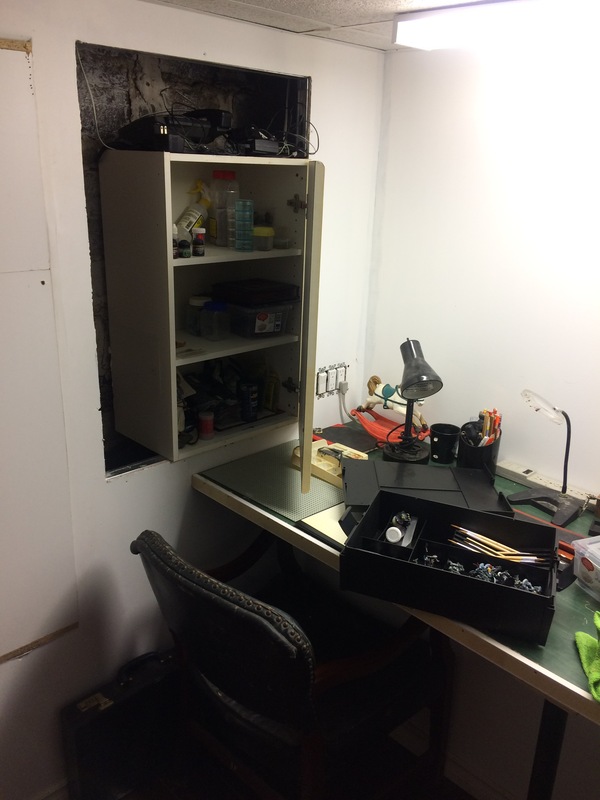 Here's a pic of the new hobby room. Still lots of junk but one tiny bit at a time. Deamon cat takes out spearman in last fight. Was chewing on a squig this time but I left the phone upstairs. Well , 2 games under my belt. 1st minor victory for tzeentch over empire and 2nd draw for empire - orks. Lots of fun. Forgot about the doggone run until about turn 3 of 2nd game. Then it sped up nicely. I don't bother with points at the moment. Just throw a good group into it and see what happens. don't bother with points at the moment. Just throw a good group into it and see what happens. I've been doing a couple of games like this. It's fun to get a couple of similar forces together and see how it goes. Last game I had with a few other players was a last stand. Everybody got a handful of guys, and one guy got a force equal to all of them. Can the rag tag group hold out?! Ha!ha! What can you say about a snobbish elf player? Now I need to come up with a lot of terrain that went missing so I've been looking around at various bits of junk. It's a actually loads of fun. I also don't miss the stress of needing to outfit entire army's in order to play. I wish i had a hobby room like that. Paint, shelving lol and it was all concrete and stone before. Except for the floor which was purchased for the basement and upstairs 4 years ago. Since there was no money in the budget for frivolous stuff, it took awhile. I could only afford this as I did everything myself. (Bonus for doing it for a living ) the paint cabinet was an old kitchen cabinet from a condo kitchen I did in February so it didn't quite fit the custom whole I had made. Still it was easier than making it. Just need to fill in the wall around it. My wife , who hates this 'frivolity' (!!??) actually gave her blessing as a sanity saver. I couldn't believe what I heard lol. It's good to be back ! I had said something in a previous thread so I had to look it up. Kicking chaos around is just plain good fun. Unfortunately they got a minor win out of it but there's always next time. I have to admit I'm enjoying this burst of hobbying. Just the looseness of the game is what I think I like about it the most. And I get to use units I never thought possible. Who would ever field empire spear men in their right minds? In they go now with their damned white and red quarter paint job. They were my first and last of that colour scheme. I remember almost going crazy and never liking the finish job. Haha, thanks for the praise! But I might be the inspiration, you still did all the work! Your man cave/game room looks really great! I love the cat! Thank you sir! 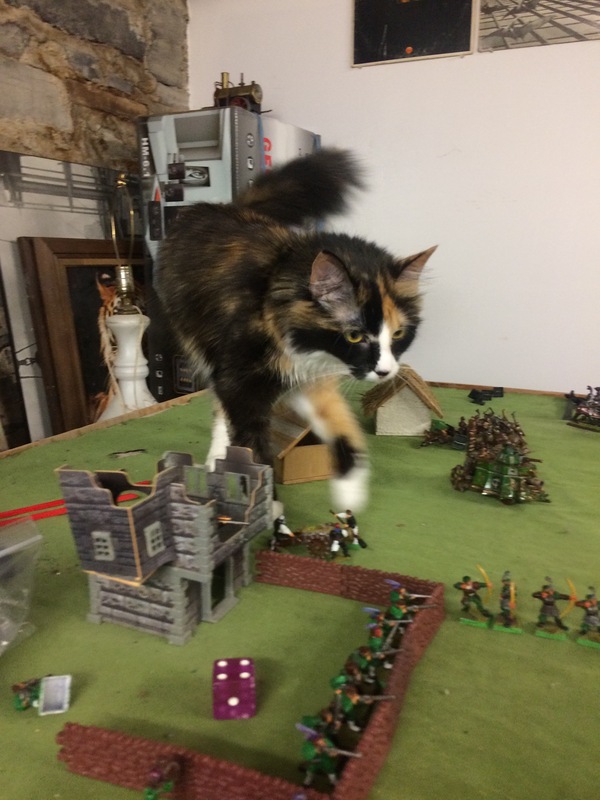 I wish I had got the pic of the cat chewing on a squig. My sanity is slowly returning with a hobby outlet. 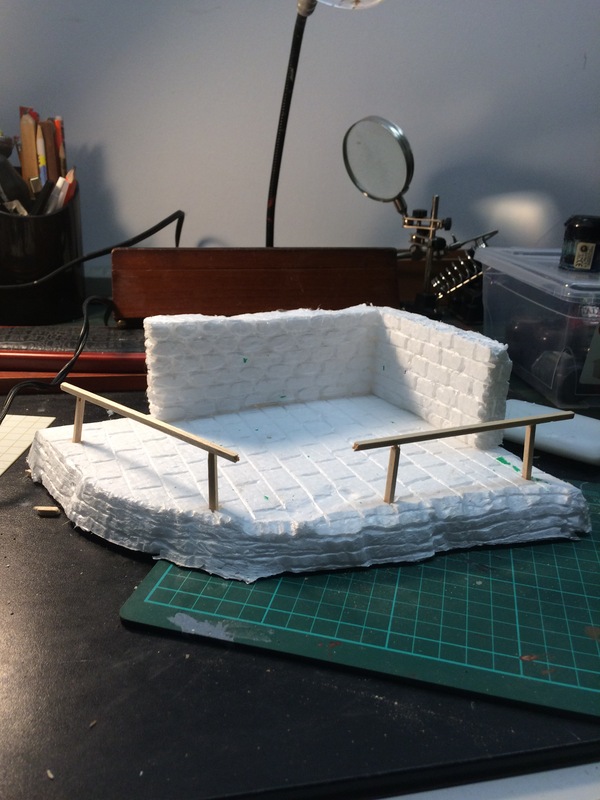 I was looking at hamsters terrain and I started on a piece last night. I'll post a pic when it's ready. If it was a Mangler Squig then I'd be worried! 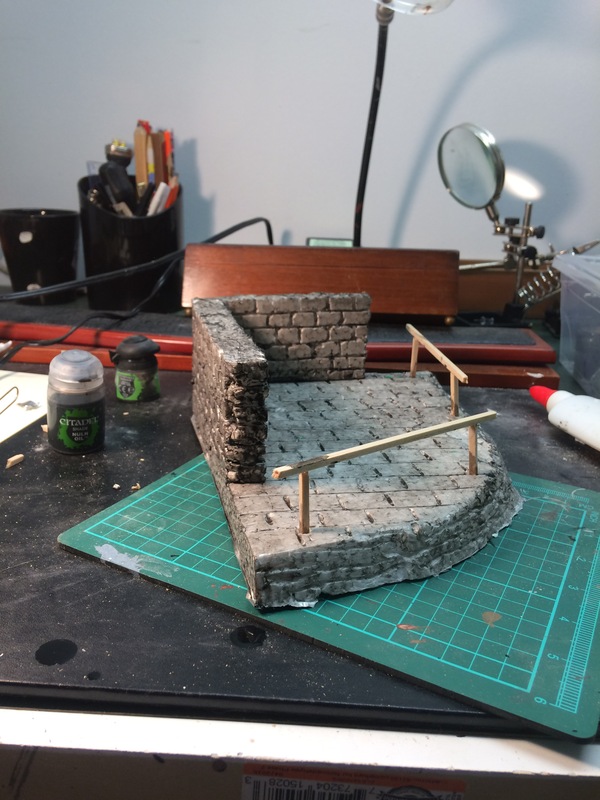 Please send the pics - I'm also looking for a terrain building inspiration. This is pretty rudimentary but it matches my budget lol. It was from a chunck of white foam insulation left over from some bloody job. I have a tool that heats up a wire and you can melt/carve what you need. Scored the surface to look like stone. (I would hate to be the mason that had to lay those blocks). Then I based it with nuln oil. Then I'll dry brush fenrusian grey on it. Maybe some green in the ground grooves to represent overgrowth. Edit:Yipes these pics are huge! !this hasn't happened before.